Brown’s captivating new study explores the roots of modern America’s fascination with things and the problem that objects posed for American literature at the turn of the century. This was an era when the invention, production, distribution, and consumption of things suddenly came to define a national culture. Brown shows how crucial novels of the time made things not a solution to problems, but problems in their own right. Writers such as Mark Twain, Frank Norris, Sarah Orne Jewett, and Henry James ask why and how we use objects to make meaning, to make or remake ourselves, to organize our anxieties and affections, to sublimate our fears, and to shape our wildest dreams. 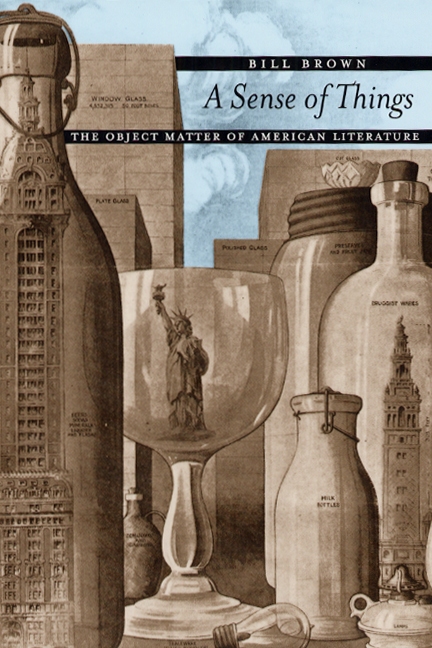 Offering a remarkably new way to think about materialism, A Sense of Things will be essential reading for anyone interested in American literature and culture. "Although Brown is by no means the first to argue that literature can ’redeem’ the material world from commodification, he does so engagingly, with ingenuity, tact, and an admirable breadth of reference. . . . A Sense of Things combines fresh thinking about literary texts with scrupulous attention both to historical context and to a wide range of speculative effort, from Thoreau through Simmel, Benjamin and Lukacs to Adorno and Lacan. The concept of fetishism seems to be enjoying a vigorous afterlife in cultural theory (after Freud, that is, as well as Marx); Brown has contributed powerfully to its nurture." "A complex and yet stimulating read. Never content with presenting a single hypothesis, Brown continually challenges his own conclusions."